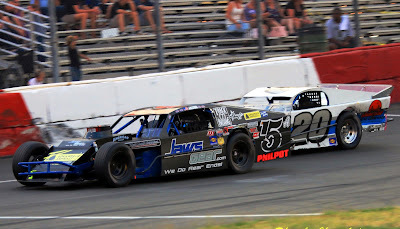 be challenging Sacramento's Jason Philpot at Ukiah Speedway Saturday Night. Ukiah, CA......This Saturday night, July 8, North State Modified Series, presented by Protect the Harvest, comes to Ukiah Speedway to begin the second half of its 2017 season. The points battle is close with four of the top five contenders hailing from Lake County. Current points leader and defending NSMS champion, Darrin Knight of Kelseyville, is only 12 points out in front of Upper Lake's Charlie Collins. Knight was the winner of the first two races in the series, the first at All American Speedway in Roseville in April, and the second at Lakeport Speedway on May 6. Running third and fourth in points are Kelseyville drivers Eric Johnson and Darrin Sullivan. Sullivan was the winner of the Memorial Day race at Redwood Acres Raceway in Eureka. Sacramento driver Jason Philpot sits fifth in the points standings with Sierra Furia of Lakeport sixth, Cody Braund of Redding seventh, Oregon driver Rich Cobb eighth, Adrianna Strugnell (Kelseyville) ninth and Cloverdale's Dustin DeRosier in tenth. All these competitors will earn $200 in Lucas Oil tow money just for showing up at Ukiah Speedway on Saturday. All these drivers plus more will gather at the Ukiah Speedway Friday, July 7 for practice, and Saturday, July 8 for the Lucas Oil Dash for Cash and the Protect the Harvest North Coast 60 lap feature. The North State Modifieds will join the local Jammers, Bombers and Jalopies. For more information visit the North State Modified Series Facebook page.